Gorkhaland Territorial Administration chief Binay Tamang on Friday announced a raft of development projects for the Darjeeling hills and also in Siliguri and Delhi, days after meeting chief minister Mamata Banerjee. Tamang, the chief of the Gorkha Janmukti Morcha, had recently announced that the party would not support the BJP in the Lok Sabha polls and said it would back a possible “Third Front”, in the formation of which Mamata is playing a major role. The main source of the GTA’s funds is the Bengal government and Tamang’s announcements on Friday suggested that he may have got an assurance from the chief minister during their meeting earlier this week. A Gorkha Welfare Centre, which will have an administrative building, an exhibition centre, accommodation and other facilities will come up at Saket in Delhi. “We will spend around Rs 32 crore for the project. Earlier too plans had been made but the project could not be initiated because of encroachment. In February, the foundation stone for the project will be laid by the chief minister. Around Rs 6 crore will be spent in the first phase. It will largely help people visiting Delhi from here,” Tamang said. The land in Delhi belonged to the now-defunct Darjeeling Gorkha Hill Council and the GTA, which has replaced it, has won a court battle to free the land from encroachments. 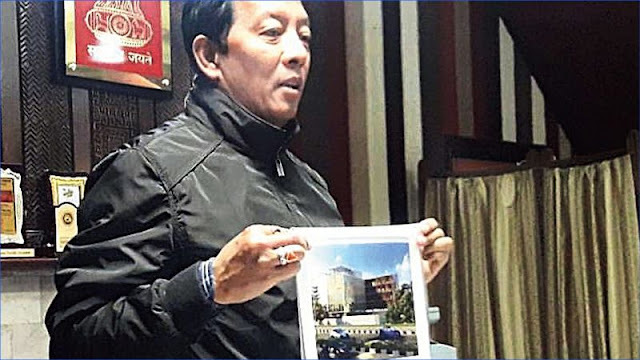 “We will also develop a tourist information centre that will have office space and accommodation facilities at an unused building of the GTA at Darjeeling More in Siliguri,” the Morcha leader added. Next week, the Bengal youth services and sports department will hand over a building to the GTA in Matigara on the outskirts of Siliguri for use as an accommodation facility for students and relatives of patients and others who frequently visit Siliguri from the hills. The GTA will also renovate all tourist lodges and resorts run by it, build a parking lot in Kurseong and a residential sports academy in Sukna, around 10km from Siliguri. “We have planned to constitute the GTA Mountaineering and Adventure Sports Foundation to encourage adventure sports in the hills. Mountaineers will be recruited as office-bearers. A separate wing will be constituted for the conservation of the lake in Mirik,” Tamang said. Tamang said the state government had agreed to hold elections to the GTA in August or September this year, after the Lok Sabha polls.